You can get your full version very fast! You could work with your favorite application today! 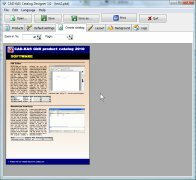 Buy the original PDF Editor from CAD-KAS (2003-2019). We are the first who enabled our customers to edit PDF files afterwards. PDF Editor is in use in many companies and on private computers around the world and we have many happy customers of this product. You could be your next happy customer! It does not take more than a few minutes of your time. Do you need an individual software solution? We can develop the software you want for you. Please send us an email. How do you change PDF files afterwards? Don't work? Sure it does! It is easy with our PDF Editor. With PDF Editor you can edit PDF files easily and make changes afterwards. No need to write everything again, only because a few sentences or a picture needs to be changed. You save yourself a lot of time using PDF Editor. If you need to change a price, a phone number or an address, you can do the changes with very little effort with PDF Editor. You save yourself a lot of time and money. Give a direct feedback to the author of the document what needs to be changed with the annotation functions. No need to describe this in an email, just show them and send them the document back. Give your customers the chance to fill out your PDF files directly on the computer with the help of the form fields. No need for your customers to first print it out and then fill it out. This makes it more likely that your customers fill out the form. This will bring you more customers and more money. To edit files in the PDF format is foolproof. 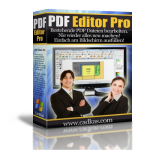 Download the PDF Editor trial version for free and convince yourself. Maintain the overview over your inventory. This is a very easy to handle program. It does not matter if you have a little online store or sell at ebay this is the program for you! You can use the software as point of sale software. Create lettering in any installed TrueType font or single line font and save the result as DXF file or G-Code file. Ideal to plot letters for signs, engravings. Convert CAD drawings in paper form or picture form automatically into vectorized DXF drawings which you can edit with your CAD application. Scan a drawing or load a picture from your hard disk into our program. 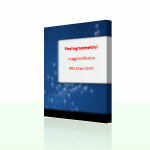 Create product catalogs with many pictures, article numbers, descriptions and product variants in table form and volume discounts. 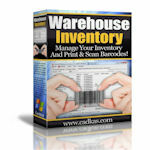 Create barcodes in high quality fast and easily! Export your barcodes into bitmaps or as wmf/emf metafile or copy it into the windows clipboard and then paste it directly into your application (Word/Excel). 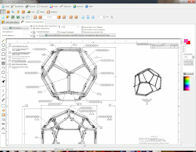 Do you receive PDF files with CAD drawings from a CAD application like AutoCAD? Now you can extract these drawings and save them as DXF file again to open it in you CAD application. Did you forget the password to remove the encryption and limitations of a PDF document? Now you can not print or copy your own PDF file? No problem! With PDF Password Recovery you remove the PDF encryption with one click. Edit scanned documents WITHOUT ANY LOSE. It does not try to recognize the characters at all. But it lets you simply edit scanned documents. Display and simulate your G-Code programs on your PC. It draws the tool path on the screen. So you can debug your G-Code programs. It let you run the program step by step if you want to fix this one bug. 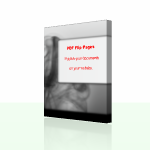 Publish your PDF documents as interactive flip page documents directly on your website. No need for a PDF reader to view the document. It will display directly in the web browser. Rectify photos with the help of photogrammetry. So you get a completely level view of one side of a building for example. So you can take the result for measurements of this building. You can export the result as picture or as DXF file. If you take a photo of a rectangle what you get is a trapezoid. 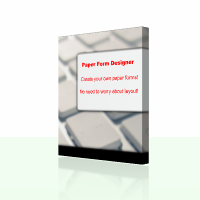 Create your own paper forms for printing. Do not care about the layout at all. Simply enter all you want to query: name, street, city etc. Possible fields are text fields or free size, checkbox fields and radio fields. You can sort the fields into different segments (categories). Convert B-Spline curves contained in DXF files into arcs. So it will be possible to further process the dxf files and use it with your CNC machine. The program reads existing DXF files and writes the result into a new DXF file. You can specify the maximum deviation of the arc polyline curve from the original B-Spline curve. You want to build your own cryptocurrencies but you do not know where to start? 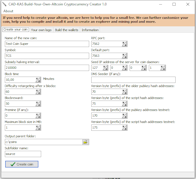 With Build-Your-Own-Altcoin Cryptocurrency Creator you can create your altcoins with a few mouse clicks. You save at least a few hours or even days of work even if you are a developer. If you are not a developer you can start your own altcoin without the need to change any program code. If you need further help in the creation of your altcoin you can contact us and we will help you.